This paper is part of CGD’s Value for Money initiative. Join us for a related event on September 25 in NYC, with Mark Dybul, Executive Director of the Global Fund for HIV, TB and Malaria and representatives from PEPFAR, CHAI and the Gates Foundation. Learn more. As the largest bilateral donor in global health, the President’s Emergency Plan for AIDS Relief (PEPFAR) is unequaled in its reach and impact. Yet despite its larger-than-life profile, we’ve found that the details of its implementation arrangements and decision-making often remains obscure to the longstanding chagrin of global health observers. Among the common questions: Where does scarce PEPFAR funding go? Which countries and implementers receive the bulk of PEPFAR funds? And what factors influence PEPFAR’s allocation of resources across recipient countries? We systematically track the financial flows of PEPFAR – from donor agencies via intermediaries and finally to prime partners. We manually reviewed and analyzed publicly available government documents; a Center for Global Development dataset on 477 prime partners receiving PEPFAR funding in FY2008; and a cross-country dataset to predict PEPFAR outlays at the country level. We find that PEPFAR has led to substantial presence of US-based organizations operating in recipient countries. There were 477 PEPFAR prime partners in FY2008. 22 of the largest 25 recipients (by total planned funning) were based in the US. Only 8% of the total ($301 million) was allocated to developing-country governments as prime partners. US Congress’s past designation of ‘focus countries’ is a major predictor of PEFPAR funding, though the rationale underlying the selection process for focus countries is unclear. When considering disease burdens, there are clear inconsistencies in the PEPFAR funding levels between comparably deserving countries. Further work is needed to quantitatively evaluate the extent of contractor proliferation and its effects on PEPFAR’s efficiency and long-term sustainability. The US government should disclose its contracts to prime partners and sub-partners in a machine-readable and open format consistent with the USG Open Data Policy. Moreover, PEPFAR can improve the allocation of its funding through a more explicit rationing mechanism. 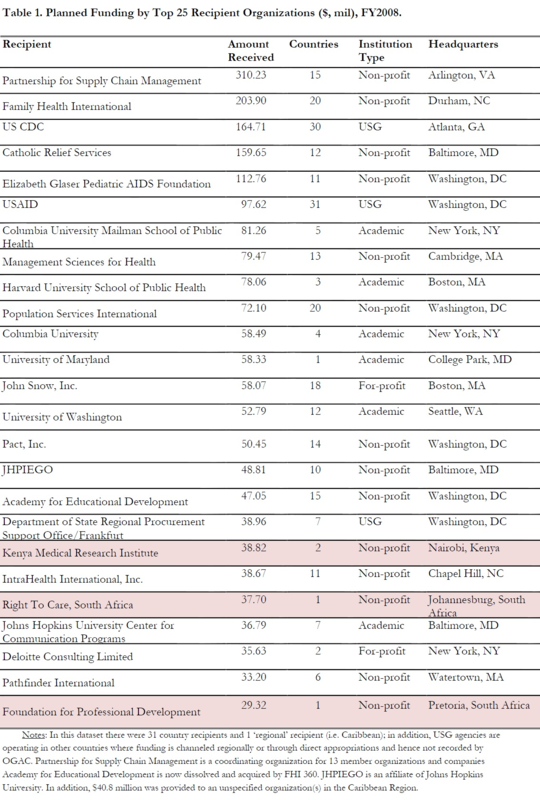 As a preview, Table 1 shows PEPFAR’s top 25 implementing partners for 2008. Funding appears to have been strongly concentrated within a handful of US-based organizations. While these 2008 data are not current, it’s notable that the IOM’s own time-series analysis in its 2013 evaluation for selected countries found only slight movement of funding over time toward local governments and civil society organizations – indicating only a gradual transition to country ownership. We hope you find these results interesting and enlightening, and we look forward to hearing your feedback – either in the comments below or over email.